In both cities, I imagine, activists are considering the need to mobilize against imminent jail construction in a moment widely celebrated by bipartisan coalitions as an epoch of decarceration and criminal justice reform. The question of whether problems in either city jail system can be resolved by jail construction is a complicated one. After World War II, counties across the country embarked on the project of replacing archaic jail facilities; by 1978, nearly 60% of the nation’s jail population lived in facilities built after 1950. In spite of this construction, a rights revolution of class action lawsuits over jail conditions flourished throughout the United States. 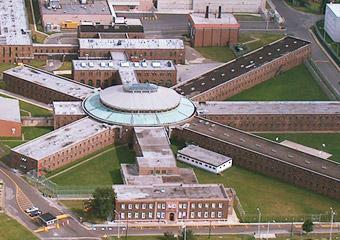 Mattick’s concerns that new facilities would remain understaffed, dirty, and dangerous were born out by the ensuing forty years of class action suits at Cook County Jail in Chicago. Every time administrators asked for funds to build a new building, they promised improved conditions; with each new building, there were more allegations of inmate maltreatment. Today, an ongoing class action suit by the MacArthur Justice Center focuses on two of the Jail’s newest buildings, all of which should, on paper, meet modern day correctional standards. Charging “The sadistic violence and brutality at the Cook County Jail is not the work of a few rogue officers,” it seems likely that new buildings have not resolved a culture of violence that is rooted in labor practices at Cook County Jail. With this history in mind, should we dismiss jail construction altogether? In the Philadelphia case, I don’t doubt for a second that housing people in a facility built in 1874 is a living nightmare for both detainees and staff. A new facility would probably be a vast improvement, and indeed, replacing a structure that is over one hundred years old is kind of a policy no brainer. I doubt that a fight against jail construction in Philadelphia will be successful. As the call for construction at Rikers comes on the heels of inmates saving a corrections officer from a sexual attack, it is difficult to argue with the fact that existing jail spaces aren’t dangerous. They are dangerous. However, discussion about jail construction must also be accompanied by a reassessment of how local courts use bail and how much pre-trial detention in these facilities is truly necessary. Jail administrators will choose construction to deal with their internal problems; it is a tool of reform that they will use in spite of evidence against its efficacy because it is one of the few tools they have. Unfortunately, jail policy is often made in isolation from the policing and judicial contexts that fill jail beds in the first place. The best way to avoid jail construction is to divert those arrested from pre-trial detention through a reduced dependence on money bail. Only after the courts have done their part to reduce pre-trial populations can communities make informed decisions about whether or not maintaining a city’s jail bed capacity is truly necessary. who’s to blame for jail problems? I took for granted that this genre of blame story was a Cook County thing. However, when my brother texted me this story from my hometown newspaper, the Tacoma News Tribune, “Tacoma’s shift away from jail brings hard time to Pierce County,” it occurred to me that the “who’s to blame” story is a common trope of jail reporting and editorials nationwide. Indeed, Googling “who is to blame for jail problems?” brought up a host of stories from the last month or two, from less populated areas in Alabama, Arkansas, and East Tennessee, to metropolitan areas such as Akron, Portland, ME, Spokane, WA, New Orleans, St. Louis, and Los Angeles, to name a few. These are not new problems, and all of them, I think, point to the problem that county jails sit at the nexus of multi-jurisdictional crime control efforts that involve too many stakeholders and too little accountability. For much of the twentieth century, counties tolerated jail problems as the status quo. It the 1960s, counties began to turn to states and the federal government for guidance and funding, or were forced to make changes by state jail inspectors and judicial intervention. The outcome of these shifts was that counties had to expand jail facilities beyond their governing capacities in order to keep jails in scale with the rest of the expanding criminal justice system. Few counties in the country can actually afford to operate their jails to meet current demands of policing; few counties have the expertise to manage large jail populations or to make sound long-term jail policy. The lessons of the past thirty years are clear: too many counties have used construction as a substitute for reforms to bail and bonds, policing, mental health, drug rehabilitation, education, job programs, and community corrections. Small time politicos can point fingers all they want, but change won’t come until counties shift their focus away from who’s to blame for problems in jail to meaningful and far-reaching reform and expansion of the services counties provide to citizens.